LOS ANGELES. Its very name conjures up images of palm trees, sandy beaches, film studios and movie premiers, beautiful people who never seem to age, and an extravagant, sometimes "over-the-top", lifestyle. But in the mid-1800s, that was hardly the case. The name "Los Angeles" is Spanish for The Angels. There is much more to this name, however. In 1769, Father Juan Crespi, a Franciscan priest accompanying the first European land expedition through California, wrote in his journal about a beautiful river they had discovered. In 1781, a new settlement was established along that same river. That settlement officially came to be known as "El Pueblo de la Reina de Los Angeles", or "The Town of Our Lady the Queen of the Angels". The oldest house still in existence within the City of Los Angeles is the Avila Adobe, which is located on Olvera Street, in an area which has preserved Los Angeles' Spanish and Mexican history. 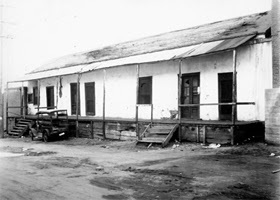 The Avila Adobe was constructed in 1818 by a wealthy land-grant owner, Francisco José Avila, who was mayor of Los Angeles in 1810. 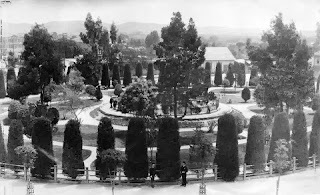 Members of the Avila family resided in the Avila Adobe until 1868. From 1868 to the early 1920s, the Adobe went through multiple uses, including being used as a restaurant and as a rooming house. Historic Olvera Street started out as a short lane called Wine Street. In 1877 the street was extended and its name changed to Olvera Street in honor of Agustin Olvera, who owned a home at the end of the street across from the Plaza, and who was the first county judge of Los Angeles. Several historic buildings line Olvera Street, including the Avila Adobe, the Pelanconi House -- the oldest brick house in the city, dating from 1855 -- and the Sepulveda House, a Victorian structure in the Eastlake style, built in 1887 as both a residence and commercial building. By 1903 the street had considerably declined, and an electrical substation was built next to the Avila Adobe to provide power for Los Angeles' electric streetcars. The Italian Hall, a center for Italian organizations, was constructed in 1907 at the north end of Olvera Street. Across the street, the Italian winery expanded its building in 1914. The condition of Avila Adobe deteriorated over the following years and was finally condemned in 1926 by the City Health Department. 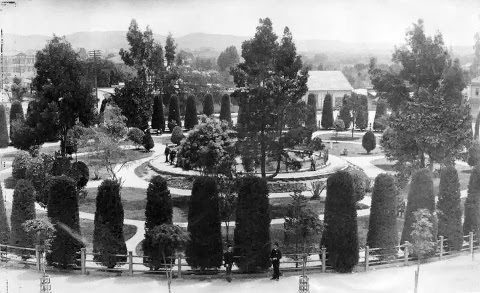 This caught the attention of socialite Christine Sterling, who during a visit to the Plaza and Olvera Street in 1926, was so appalled by the run-down condition of the oldest part of the City, that she began a public campaign to save the Adobe and Olvera Street. With a vibrant future of the Olvera Street area in mind, Sterling envisioned a colorful Mexican marketplace and cultural focal center. With funding provided by several influential businessmen and publicity from the Los Angeles Times, she established a corporation to revitalize Olvera Street. Descendants of the Avila family gave permission to allow Sterling to renovate the Adobe. In addition, she solicited money, materials and labor to accomplish the repairs. Unusual help received by Mrs. Sterling included engineers from the City Department of Water and Power who drew up plans to grade the street, and the Sheriff's Department who provided prisoners to do the labor. In 1929, the Los Angeles City Council closed Olvera Street to automobile and bus traffic, creating a lovely pedestrian avenue for people to stroll, shop and dine -- as seen in the attached vintage video produced back in 1937 as a travel promotion, and which is reflective of the 1930s. Today, both the Avila Adobe and Olvera Street are part of the Los Angeles Plaza Historic District, which is a designated California State Historic Park. The entire District is listed on the National Register of Historic Places, and Avila Adobe is a registered California Historical Landmark. The Avila Adobe is open to the public as a museum -- furnished as it might have appeared in the late 1840s -- and Olvera Street is a favourite of locals as well as tourists seeking a "peek" at what life was like in early Los Angeles. Reservations close February 15th of each year during which we offer this Tour.